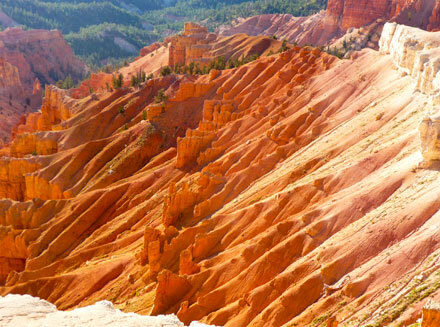 Cedar Breaks is a small gem of a National Monument located near Brian Head, Utah. 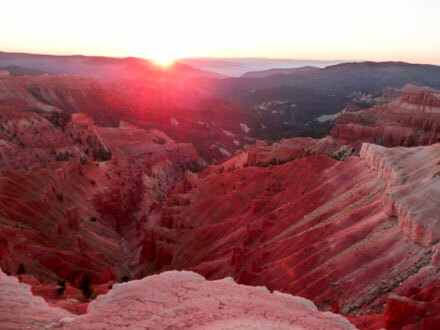 The centerpiece of Cedar Breaks is a giant amphitheater spanning some three miles. And that is more than 2,000 feet deep. It is a wonderful place. 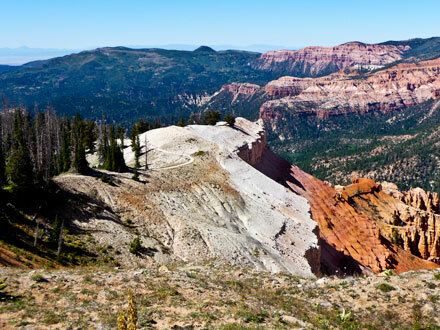 Because Cedar Breaks is at about 10,000 feet in elevation, it gets considerably more precipitation, much of it snow, than the surrounding desert. This means that there are tress, grass for grazing, and a small alpine lake. The downside of all the precipitation is that the monument is closed to automobile traffic from about November to late May. It is open for snowmobile, cross country ski, and snowshoe traffic. 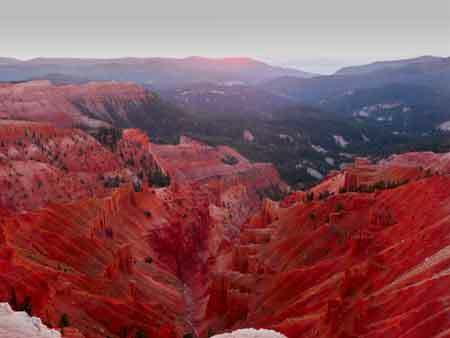 These are major outdoor activities in the Brian Head area. The area outside the national monument is used for livestock grazing. We saw several herds of sheep grazing in the area during our visit. The hike to Spectra point also takes you to Point Supreme. The trail leaves from the visitor center and takes you along the rim of the amphitheater. Much of the hike is in the open with no shade. Lucky for us the weather in September was perfect for hiking. One thing we noticed about most of the hikes in Utah---they're uphill both ways--but not, at least in September, in 15 feet of snow. The Spectra Point Trail is no exception. The trail has several sections where you go up a few hundred feet and then back down a few hundred feet. One section goes up 500 feet and then down 500 feet. In the winter, the trail is uphill both ways and in 15 feet of snow. 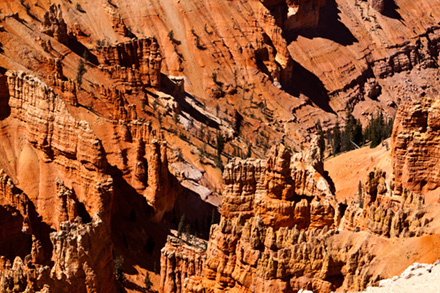 The views of the amphitheater as you hike along the trail are spectacular. 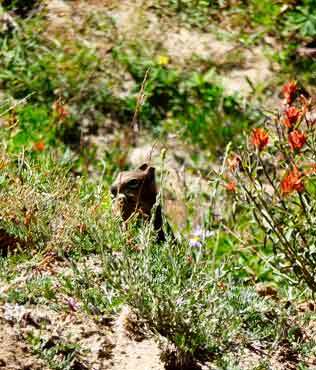 A single chipmunk was the only animal we saw on the hike. He was busy getting ready for the long winter. He was running around gathering seeds. I was surprised that we didn't see any birds flying around. Guess they were taking the day off. 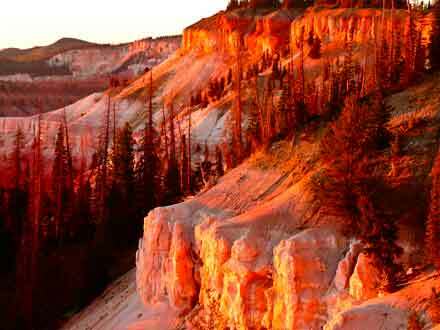 One of the interesting facts about Cedar Breaks is that there used to be a lodge here. The lodge was dismantled when the Park Service took over because it was not part of the natural environment. 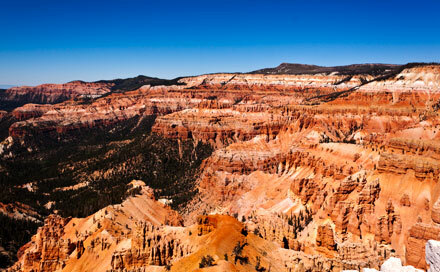 The fuss raised by dismantleing the lodge was so great, that the Park Service changed policy for all such buildings in National Parks and Monuments. The trail goes through a grove of bristle cone pines. 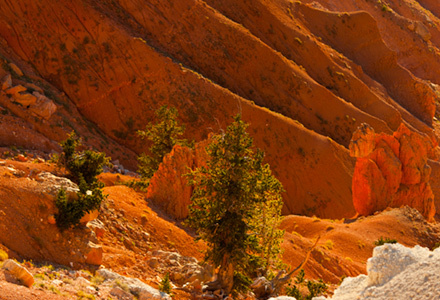 Bristle cone pines are among the oldest living things on earth. The oldest one at Cedar Point is about 1,600 years old. 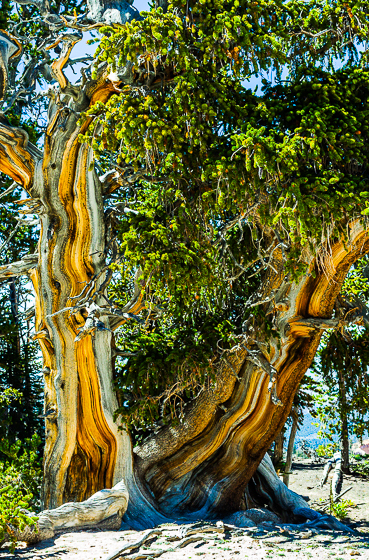 The oldest known bristle cone pine isMethuselah. 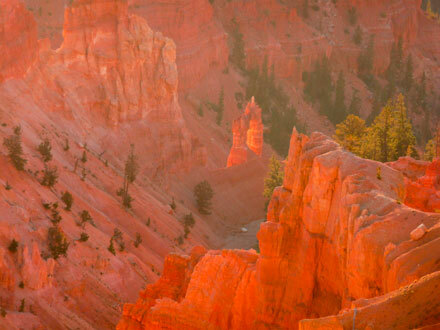 It is 4,789 years and is old located in White Mountains of California. 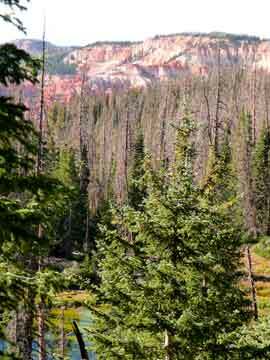 So the trees here at Cedar Breaks are just children. Several of the trees seemed to be in some distress. I'm not sure why. One of the trees that was supposed to among the oldest showed no signs of life. 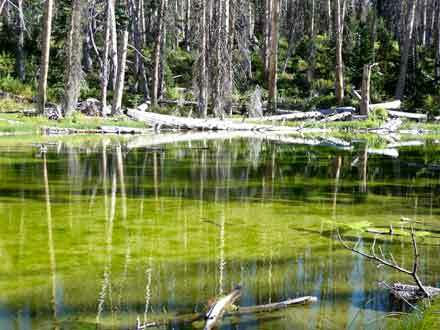 One of the nicest hikes at Cedar Breaks is the hike to a small alpine lake. The hike takes you through the forest and then down to the lake. We saw a deer on our hike to the lake. 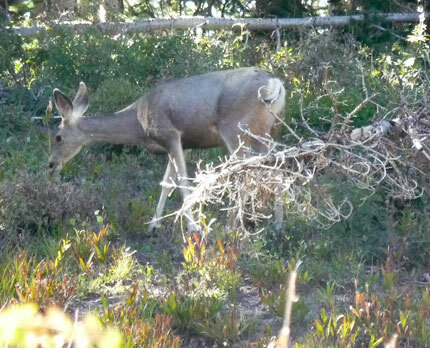 The deer here are mule deer--not the white tail deer we have at home. 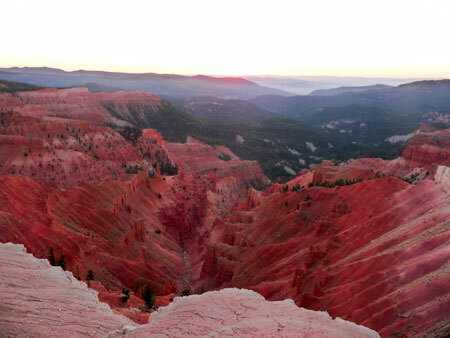 The sunset at Cedar Breaks is awesome, spectacular, beautiful, etc. 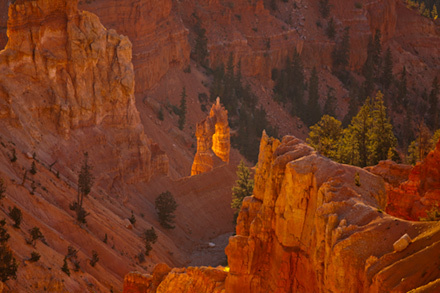 There really are no words to describe the effect of the setting sun on the formations in the amphitheater. It started with everything a deep orange and then the colors changed minute by minute until the whole amphitheater was lit up with deep saturated reds. It's hard to believe that the colors could be as deep red as they were. We stayed watching the sunset and the twilight until it was too dark to see anything. Turned out to be a really great day.